Eugene, when it is his turn to choose one of our eating destinations, takes his responsibility very seriously. He painstakingly researches what possible cuisine we have not yet experienced and, sometimes regardless of other factors, makes that his primary choice. In our most recent case, Eugene not only unearthed an obscure cuisine, he found one that was also in an indeterminable location making it a challenge for a GPS machine, Mapquest, Google maps, Yahoo maps, or any other electronic direction device. Was Arzu, the name of Eugene’s selection located in Flushing, Queens? Was it in Rego Park or Woodside? Was it on Queens Boulevard. . .67th Rd. . .67th Ave. . .67th Place? No one really knew for sure. After finally locating 67th Rd. . .but no Arzu, I found the restaurant tucked away on a side street on the opposite side of Queens Boulevard of where my Google Map had originally directed me. It helped that Eugene’s lean, dark, melancholic figure was standing outside of the restaurant or I would have missed it on my first go round. The others had not arrived, but Eugene and I went in. Thinking Arzu was in Flushing, I assumed that the cuisine was regional Chinese, but inside, the patrons and staff looked like extras from the movie Borat. I asked Eugene if he knew what kind of food we would be eating. He just shrugged. “I don’t know. It’s something different,” he said with a shrug. He was as clueless about it as I was. A quick glance at some of the grilled kebabs on long cutlass-like skewers that were appearing at other tables and I surmised that we would be dining on some variation of a “zikastan.” And after looking at the menu, which proclaimed Arzu as Kosher, the only hint of where the nation of origin for the food we were about to eat was the mention of Uyghur—as in “Uyghur hand-made Lagman (noodle soup with meat and vegetable. )” The others in our group were late. I was hungry. I ordered a bowl. 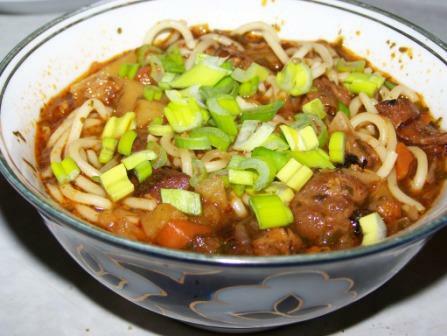 Just as I was about to begin slurping the “lagman,” my cell phone rang. It was Gerry. There was desperation in his voice. “Can you please just walk out of the restaurant and wave,” he pleaded. I took the phone and went out of the restaurant, waved, but in the darkness of 67th Rd, there would be no way he could see me. I told him it was directly across Queens Boulevard (also known as the Boulevard of Death) from the Starbucks; a landmark Gerry quickly identified. A few moments later, Gerry, along with Mike from Yonkers and Zio filed in. Neither Zio, Mike from Yonkers, nor Gerry were familiar with the cuisine of Uyghur nor did they know where that country might be located. It took a session with my son, the geography whiz to learn that Uyghur is in fact, the name of the peoples who populate East Turkistan bordered by China on the east and Kazakstan on the west. And, with the exception of the very smooth, slightly spicy soup, we soon learned that the food is as rough as, undoubtedly the terrain of that region. 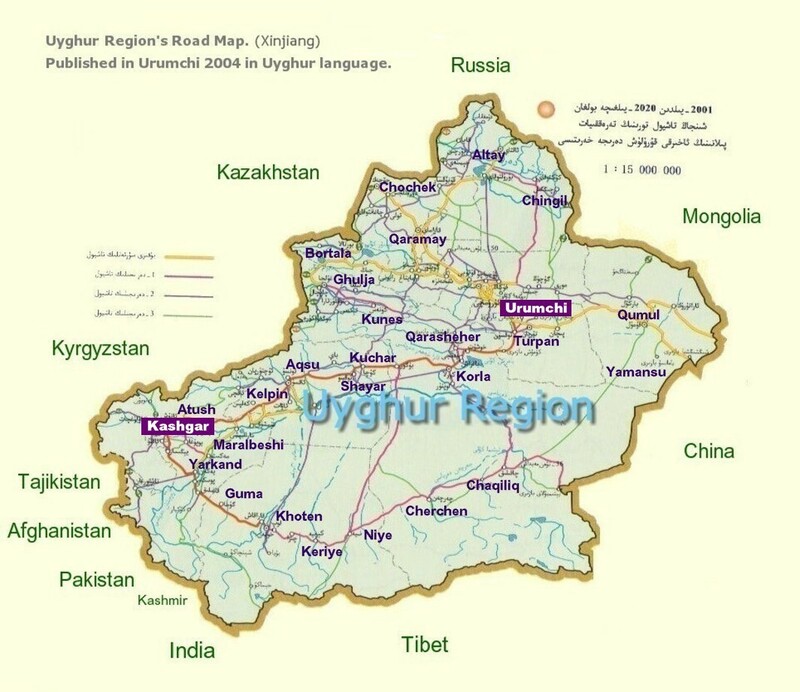 I wonder if there is a 67th Road in the Uyghur Region? Eugene’s very limited charm was having no effect on our waitress as he tried hard to get her to help us in making our choices from the undecipherable menu. 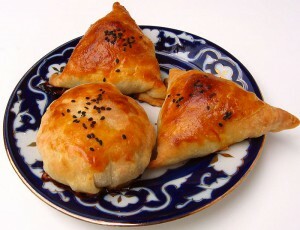 She was able to figure how many orders of meat pies and steamed dumplings appetizers would be suitable for our party of five and brought them to us immediately. After severing through the almost impenetrable crust of the pie, the indistinguishable chopped meat within tasted as if it had been sealed inside for months and was as equally tough as the crust; a small sample would have been more than enough of the meat pie. The steamed dumpling platter included half stuffed with sweet pumpkin while the others contained the same mystery meat that was in the pies. No wonder most of the patrons at the restaurant knew to bring their own bottles of vodka. Now if Eugene provided us with no other information than that, his duty would have been more than fulfilled. There wasn’t much to say about the shish kebabs. They were what they were: grilled meats on a skewer. The soup had helped satisfy me, but Zio wanted more and unashamedly scooped the remains of the meat pie onto his plate. “Yeah, I know its dog food, but I’m still hungry,” he said. The others were, not surprisingly, feeling somewhat undernourished, but none dared return to the meat pie. Instead we tried the local “halvah” dessert; a tiny, pistachio-dusted diamond that surpassed anything else we ate that night along with Azrzu’s other dessert offering, a mound of dried Chinese noodles soaked in honey that, sadly, was the perfect complement to the unfortunate meat pie. The mystery of the meat pie can be found buried within. Open at your own risk.